Lights Out Summer ($15.95, 296 pages, ISBN: 978-1-60381-213-9), by Rich Zahradnik, is book four of a mystery/thriller series featuring newsman Coleridge Taylor. The series is set on the mean streets of Manhattan and surrounding boroughs in the ’70s. While the rest of the media pursues the Son of Sam story in the spring and summer of ’77, Taylor investigates a murder that happened the same night as one of the serial killer’s attacks. The story will take him places he’s never gone before, including into Park Avenue society and onto the streets during a blackout when the city endures massive looting. Read “Rich Zahradnik Reflects on Lights Out Summer” in the Mystery Tribune. Book 3, A Black Sail, earned a starred review in Library Journal: “Fans of the late Barbara D’Amato and Bruce DeSilva will relish this gritty and powerful crime novel.” It is also a finalist in ForeWord’s 2016 Book of the Year Contest. “Well-plotted [….] Zahradnik nails the period, with its pack journalism, racism overt and subtle, and the excess of the wealthy as places like Studio 54, as he shows how one dogged reporter can make a difference.” Read more…. “A descriptive, fast-paced story that is very well researched. Readers will fly through the pages in order to reach the climactic conclusion.” Read more…. “Taylor Coleridge is a protagonist who is well conceived and very, very well developed. Rich Zahradnik was himself a longtime and well-respected newsman and his knowledge, experience, and love of journalism pour through Taylor. It appears to me that this series is growing in focus and strength—the episodes are getting better and better. [….] Good reading.” Read more…. “Lights Out Summer is a gripping multiple-murder mystery overlaid with tremendous atmosphere and action. Here’s hoping a fifth Coleridge Taylor adventure is in the works.” Read more…. “The perfect visual and suspenseful mystery led by a believable and easy-to-like character.” Read more…. “[Taylor’s] fight for justice creates a gripping murder mystery chock full of action and brimming with social consciousness.” Read more…. “[Taylor’s] zest for doing what’s right while following such gory leads makes the reader root for him from end to finish. It’s wonderful to see Rich broaden the world he’s created around this determined character. […] The author has painted the emotions and situations these characters find themselves in so vividly that you can imagine yourself standing beside them as they dive deeper into the world around them. If you have yet to experience this series, I truly recommend it. More, please!” Read more…. “[Lights Out Summer] contained a number of sympathetic and credible characters along with the well-paced suspense of the narrative. I’m glad I didn’t miss it.” Read more…. “The beauty of the story is that the author makes the reader care. The characters are delineated well. They are real people. [….] You just may get hooked on the Coleridge Taylor mysteries.” Read more…. “Rich Zahradnik’s gritty writing allows the reader to feel he is with Taylor going into rough territory in New York, digging to get his story. [….] Be ready to sit on the edge of the seat as the mystery unravels!” Read more…. 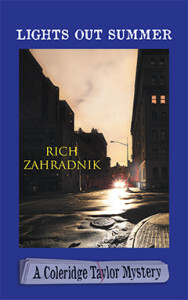 “Lights Out Summer is the fourth in this series by Rich Zahranik. I have not yet read the first three, but if they are as well-written as the fourth, they shall be high on my must-read book list [….] How all this is resolved would make your heart stop for a moment or two.” Read more…. “No one.” Abigail began weeping. Her head tipped to one side like she couldn’t quite control her neck. Taylor looked for a box of tissues, but saw it was on a side table next to the couch. He waited. ‘Makes no sense.’ The unending chorus of the families of the murdered. Abigail went to a small black table crowded with pictures and handed him a portrait of a pretty black woman in a black graduation gown looking over her shoulder as people did in such shots. Her smile was on the edge of laughter, like she’d cracked up right after the shutter snapped. The eyes, a deep brown almost-black, were in on the joke, crinkled at their corners. Her hair was parted in the middle, wavy and thick, falling down around her shoulders. The phone rang. Abigail went to the kitchen to get it. The low mumbled conversation lasted a couple of minutes. Shows a lot of concern for the sister of a murdered maid. Is that normal? Taylor didn’t know. He didn’t know much about big Park Avenue apartments and the maids working for the families inside them. The police beat rarely took him to such homes. Maybe this DeVries was being a good human being. Good people lived at all sorts of addresses in New York City. Still, he circled the name and address in his notebook. A visit to the victim’s workplace was always worthwhile. He lifted his head from the pad, and as he did, Abigail, who was absently scratching her lower arm, yanked the sleeve of her thin red sweater all the way down, holding it in place with her fingertips. Before she could get her arm covered, Taylor caught sight of bruised blotches—the ruptures of needle tracks. Drugs got you killed in New York City. Easy. All the time. Mess with the wrong pusher. Owe too much. Turn snitch or get accused of same. He observed Abigail with fresh eyes. He’d taken her for too thin and not thought much of it, but there were hollows in her cheeks and dark patches under her eyes. She’d been slumped on the couch and slow in her speech, which he’d thought was grief. Those were also signs of being high. Without the thinning of the face and the dark areas under the eyes, she resembled Martha—as far as you could tell from a photo. Abigail’s hair was pulled back, so it was hard to guess at length.